This cheese ball is sure to score with your family and friends. 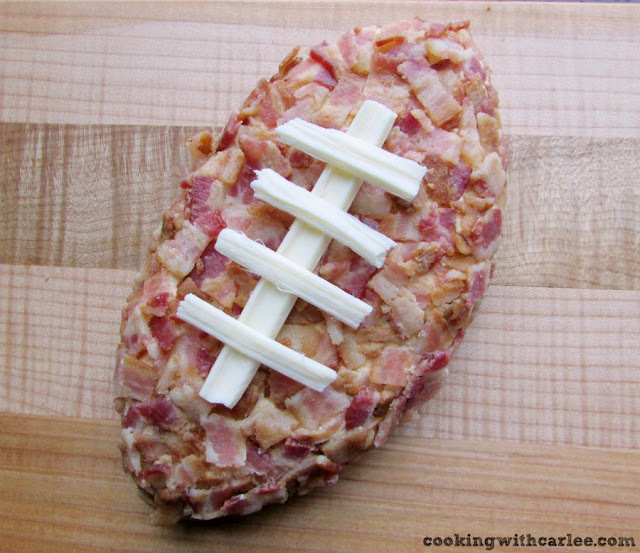 Bacon, cheddar and ranch come together in this football shaped treat. Perfect for the big game or any get together! It's that fun time of year when we really get locked into football. People who are just kind of fans are suddenly paying attention. Even non-fans are wondering what they should eat during the big game. The folks who are just there to watch the commercials need to eat too after all! We start warming up for the big dance by making extra snacks during the playoffs. We need to be good and ready, after all! When we are planning the menu for a big football game, there are usually plenty of buffalo chicken options. We love our buffalo chicken dip and buffalo chicken taquitos. We also love chili, stuffed jalapenos and kickin' corn dip. But not everyone likes the spicy food as much as we do, so I always try to have plenty of milder options as well. This Pig Skin Cheese Ball is a perfectly fun and easy way to celebrate. The shape makes it festive football food but it is really perfect any time of year. You can roll it into a ball of course. In fact, I recommend you do that for your next potluck. Cheese, ranch and a pound of bacon are sure to make it popular no matter the shape. But right now, the football is the only way to go! I made this for the Sunday games last week. They were both nailbiters. A pot of chili and 2/3 of this cheese ball disappeared in no time. Maybe it was all the stress? That may have had something to do with it. But the fact that it is delicious didn't hurt anything. In fact, as each new person arrived my husband suggested they shouldn't try the cheese ball. "It's terrible" he said, trying to save what was left for himself. Then he dug in for another bite. We were all surprised he didn't end up skipping the crackers and just go for it with a spoon as time went on. If you are looking for more fun football shaped food, there are always the stuffed pizza footballs and MiMi makes a mean cookies and cream cheese ball that is also cute as a football! What are your favorite football watching snacks? Chop the crisp and cooled bacon into small pieces. Stir together the cream cheese, ranch mix, cheddar and 1/3 of the bacon pieces. Form into a football shape and wrap tightly in plastic wrap. Refrigerate for at least a half hour. Remove plastic wrap and football on serving tray. Press remaining bits of bacon into the ball to coat. Use string cheese to make laces on the ball. Labels: apps and snacks, Family Favorites, Football! This has to be part of my Super Bowl Party potluck at work. Everybody will love it. Who doesn't love bacon? 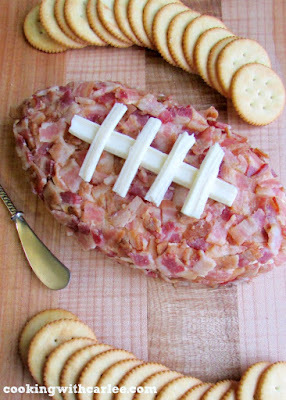 All of the football food ideas look good. I'm so glad the Super Bowl is in February. Diet rush season is over and I can cook and share again! How fun to have a Super Bowl Potluck at work! We should do that too! This would be perfect! LOVE THIS!! Cutest cheese ball ever and the way we love football in this house, well this is a definite make!!!! So cool! The pigskin cheese ball is such a cute idea! Love all the recipes that were shared in the roundup. Thank you! I know, me too. I wish I could try a bit of each! I'm not much into football, but I love cheese ball! What a great party idea! Stopping by from the Family Joy link up. The food makes it tolerable for the non-football people too ;-) Thank you! Thank you for bringing more recipes to Family Joy Blog linkup. What a fun recipe!!! Perfect for the Superbowl! Hi Carlee, the sound of my stomach rumbling has just woken up the rest of the family. Bacon and cheese? With a chili dip? What's not to like? This cheese ball sounds perfect for marathon television session (I'm not a football fan). Ha! Oh no, don't wake up the family! It is definitely a fun one, even if you aren't a football fan! I am loving the Pigskin Cheese Ball. I love any type of cheese and the #FootballFood roundup will make it easy for me to finalize my menu for the Big Game! It is one of those that you keep finding your hand going back for more, even if you aren't hungry! Thank you! This football has my name all over it. I love that you mixed the cheddar with the cream cheese. And the ranch dressing mix gives it greay flavor and zing. Then to wrap the whole thing in bacon? Oh my goodness! Can't wait to try this. I hope you love it, it was definitely a big hit here! This looks great. Great for the Sunday game days. You are our our most clicked link for Family Joy Blog Link Up party #52. Don't forget to join us Sunday-Wednesday to link up again. Have a great weekend. Hooray!!! Thank you so much! 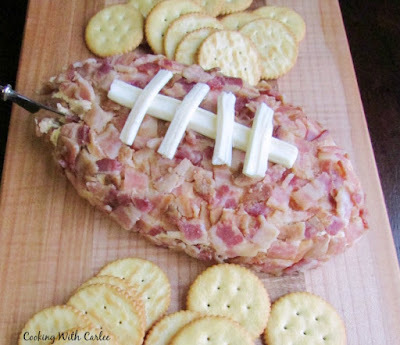 Your Football Cheeseball looks so cute and would be great for the big game! Hope you are enjoying your day and thanks so much for sharing your awesome post with us at Full Plate Thursday! It's hard to go wrong with bacon and cheese! Thanks, Jessica! The pig skin cheese ball is super adorable! I'm sure it's just as tasty. Thanks for sharing at Funtastic Friday. Classic flavors that you can't go wrong with! Great post! Thanks for sharing, it's perfect for our football party recipe round up at celebrate 365!